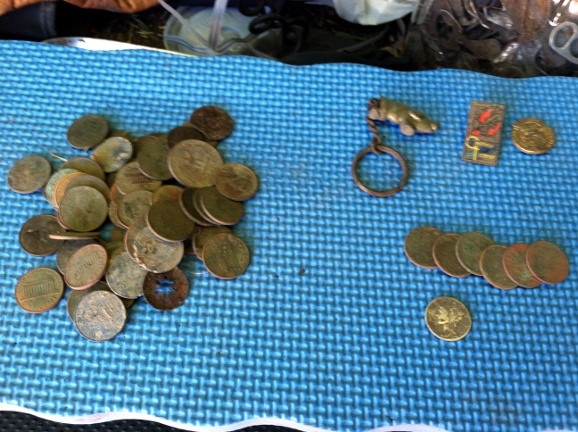 I went hunting yesterday with lawdog1 who is a member of the Friendly Metal Detecting Forum. 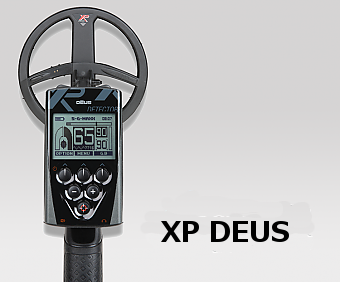 He took his AT Pro with the 5×8 coil and I hunted with Maurice, my trusty XP Deus metal detector. At one point, he asked me to to use my Deus to check a deep, iffy signal he was getting. The signal was an on and off high signal with an intermittent VDI that told him it was a copper penny. His AT Pro was telling him the target was 8 inches deep. I hit the spot with Maurice and I got a solid but mixed signal. Although I was getting a high tone, my VDI indicated that it was iron wrap-around. Additionally, the horseshoe said “not iron” (If you use the Deus, you know we have a horse shoe graphic that tells us if we are looking at iron or not). My depth said 9 inches (just a pip on the horse shoe). I was using Deus Fast with the 12KHz frequency (I changed it from 18KHz). We decided to dig the target to see. I dug an 8 inch hole with my Raptor tool and the target was still at the bottom. I pulled the dirt from the bottom of the hole to verify. I dug about one more inch of dirt and out popped out a 1941 wheat in very good condition. First, I have to say that I am SUPER impressed with the AT Pro. That’s nothing new. I have been singing the praises of the AT Pro for a while now. And I have spoken very highly of the 5×8 coil. 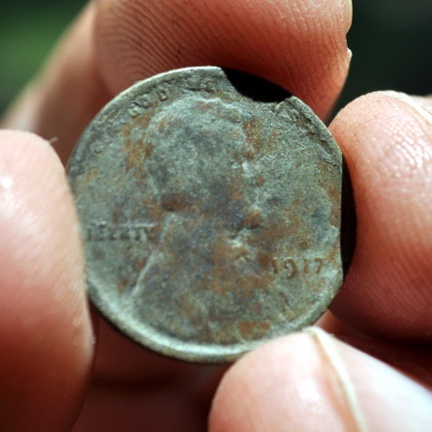 Although it was an iffy signal, the Pro with the 5×8 coil, detected a wheat cent at 9 inches. Sure, we don’t have heavily mineralized soil here in Kansas. Well, at least not where we were at. We do have heavily iron infested sites though. 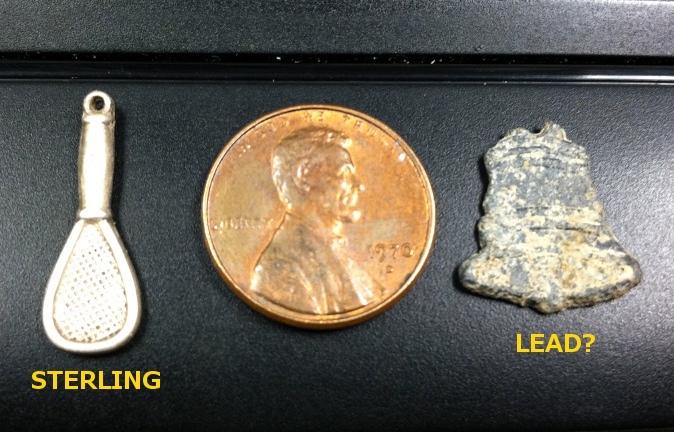 By now you should know that mineralization and iron infestation are two very different things. Be that as it may, the fact remains that lawdog1 got a signal AND a VDI at 9 inches. We both have been doing this for over a year now and we both know how to tell when a target falls from the sides of the holes to the bottom. That wheat WAS 9 inches deep. Second, I want to talk about two things that are related. Number one is that when you buy a high end detector vs a medium or low end, you will have to interpret more. Data does not become information until you process it. In this case, the Deus gave me data, i.e. the VDI, the tone, the horse-shoe, the depth. I had to then, interpret that data to turn it into information. My information may or may not lead me to dig a target. To be totally honest, I probably would have left that wheat in the ground. The trade-off between more data vs less data is that you may dig less false positives (trash) BUT, having more data to analyze may very well lead you to miss a good target if you don’t analyze the data correctly. This leads to the next thing I want to discuss. KNOW YOUR DETECTOR! Lawdog1 has been using his Pro now for a while and he knew that his machine was telling him something important about the target under the ground. I, it seems, need to spend more time with my machine and apparently, I need to dig more targets! IN METAL DETECTING, THERE ARE NO ABSOLUTES. (except that you WILL dig trash 🙂 ). On my way to pick up my niece, I drove by a boarded up apartment complex and I decided to detect the sidewalk strip. After about ten minutes of digging clad, I got a sweet signal with a Target ID of 82. 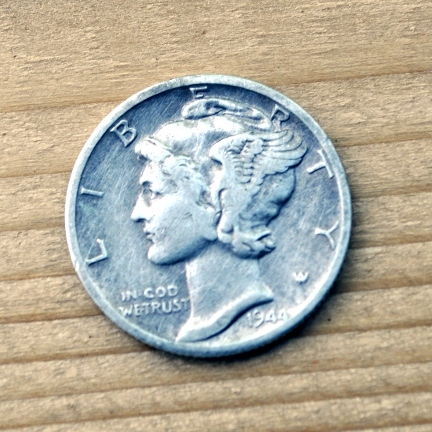 Four inches down I found this silver dime just smiling at me. A very cool token – The mystery of the Iron Pit; revealed! After work today, I stopped by the Iron Pit for a few minutes of detecting. 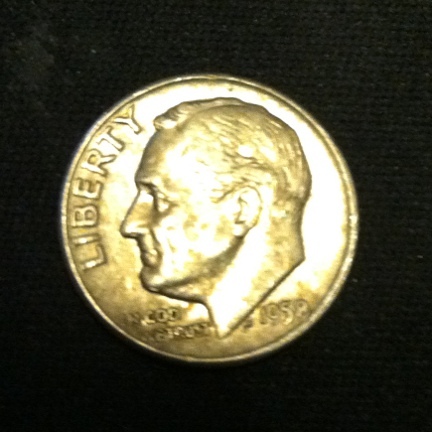 After digging a number of pull tabs and a very unexpected 1951D wheat cent, I got a very steady foil signal with a target id of 45. I got excited for a minute thinking this may be a gold item but what I dug from the six inch hole was another Wichita transportation token. I was happy to find the token anyway and put it in my pocket. Soon after, I turned the AT Pro off and went home. After supper, I went to take a picture of the wheat and the bus token and it was only then that I realized how cool the token really was. 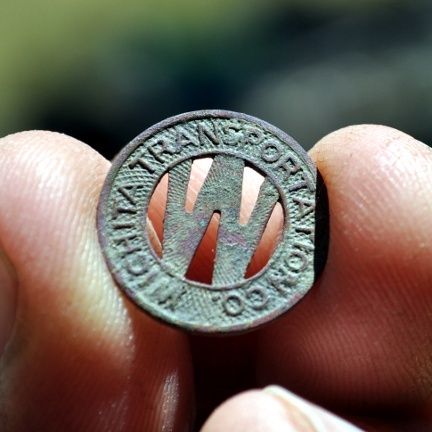 I was staring right at a Wichita rail system token! Early on Wichita’s history, the city had a rail car service that took the citizenry to and fro. 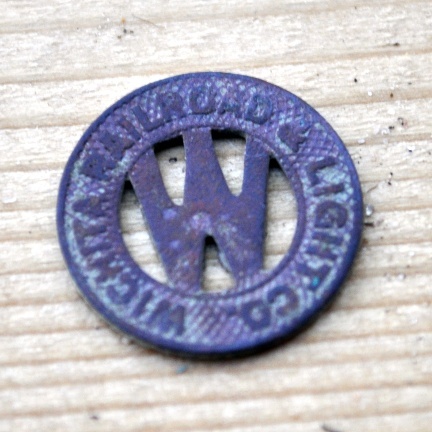 I had read about this service while researching various spots in the city but this is the first time I found a token from those days. 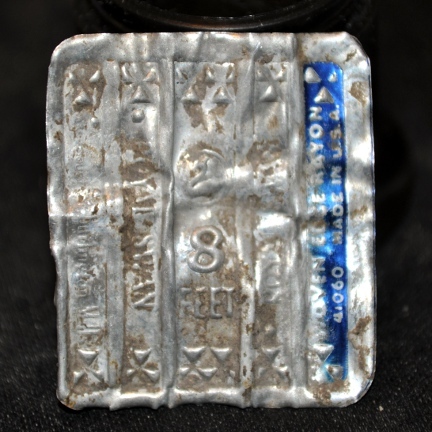 With this find, the mystery of the Iron Pit may have been solved. Since finding my honey hole last Summer, I’ve wondered why there is so much iron at the site. There are also lots of slag, coal, square nails, and rusted iron foil. I had suspected that some kind of structure may have stood at the site but it never occurred to me that one of the railways from the Wichita Railroad service may have run through the Iron Pit! According to my research, the Wichita Street Railway Co. was formed before 1890. 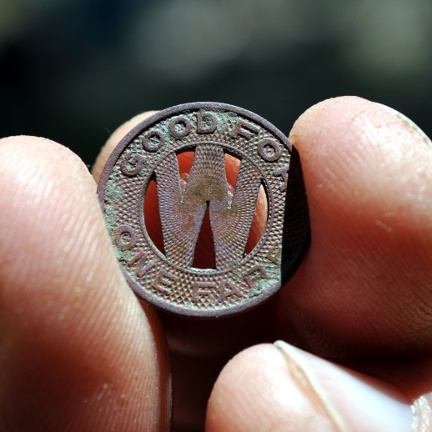 That year, the company adopted the name Wichita Street Railway Co. From 1900 to 1933 the company went by the name of the Wichita Railroad and Light Co. and it is from this period that my token comes from. Cool! In 1933, the street cars were discontinued and the Wichita Transportation Co. was born and it operated until 1966. If there was a railway running through the Iron Pit, that would explain all the metal junk there. 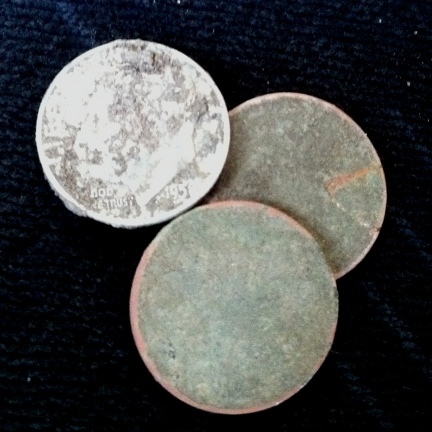 Now I am going to work really hard at finding a Wichita Railway Co. token! I went out hunting this morning for a couple of hours. I decided to try the honey hole with the AT Pro and the 5x8DD coil. First thing I did, was to change the name of the honey hole to The Iron Pit. Second thing I did was to lower the sensitivity on the AT Pro down to three bars. I did this to try to cope with the large amounts of iron there. So the idea was to dig all foil and pull tab signals and any wayward high tone. After two hours, I had dug 47 signals and only two were high tones: a 1917 wheat that I got only after I had removed the rusty nail that was masking it and a bullet. The other 45 signals were all mid tones with the great majority of them being foil. I ended up with about 7 round pull tabs and a bunch of assorted metal bits. I was just commenting to another hunter, Stevouke, that I was surprised the Iron Pit still continued to yield cool stuff. I don’t know when the Wichita Transportation Corporation started in Wichita but the newspaper has an article that says that in 1929, the company carried 18,000,000 fares. That means that there ought to be millions of these tokens laying around! The Iron Pit goes back to the late 1800’s. 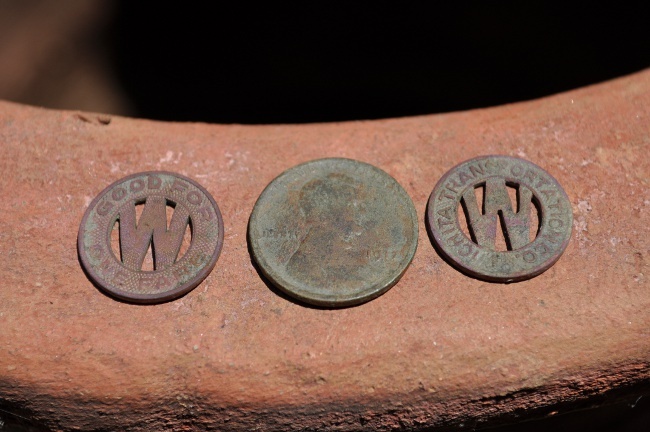 When I started riding the bus in 1980, these tokens were no longer in use. Last, I found this tag just under the ground. It is a tag for Royal Swan ribbon. This was popular in the 40’s. This particular ribbon was woven edge rayon. The term Rayon was first used in 1924 and rayon was first made in the U.S. in 1910 although it was patented in Britain in 1894. There is a very interesting article about Burlington Mills here. All in all I had a great time hunting the Iron Pit. I am going to wait until it rains before I hunt there again because digging there today was like digging through concrete.